Wow, can you believe it is almost the end of March? And that means there are just 4 days left to earn FREE Sale-a-bration items. So don’t miss out and place your order before the end of the day Sunday, March 31st. 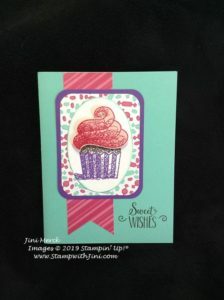 The Hello Cupcake stamp set (Sale-a-bration 149714) is one of my favorites – big, bold and fun, it makes cards easy to create with endless options. For this card I used the colors that were in the How Sweet It Is Designer Series Paper to inspire me. Here is a quick Video and PDF Tutorial for you. You can find the complete supply list below. And don’t forget right now is a great time to get those 2017-2019 In Color products and complete your collections before the retirement list posts next month. Don’t get caught without your favorite reinkers and other accessories. It’s also a great time to stock up on those adhesives (before it gets hot) and basic supplies while you can get FREE Sale-a-bration items. And of course if you haven’t tried Paper Pumpkin yet, April is going to be great. Purchase a Prepaid Subscription and you can earn Sale-a-bration items too! Join my TEAM and choose your Starter Kit for just $99! And receive over $125 in product and your kit ships for FREE! Want to Subscribe to my Channel and be notified when I post new video tutorials? Click on the image above to go to my Channel now. Have you held your spot for April’s Card Class? Copyright Info All Images © Stampin’ Up! 1990-current unless noted otherwise. This is my personal stamping/paper crafting blog. The content of this blog is my sole responsibility as an independent Stampin’ Up! 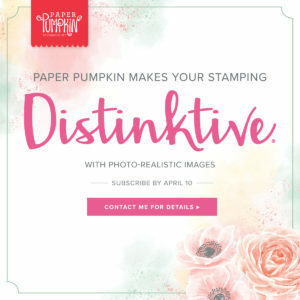 Demonstrator and the use of, and content of, the classes, services, or products offered on this blog is not endorsed by Stampin’ Up! All content including designs, text, tutorials, photos, and videos © by Jini Merck. All rights are reserved. If you use an idea you’ve seen on my website Please share the fun of stamping and post where you have seen it on my blog. Thanks!